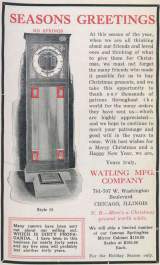 Coin-op Scale published 91 years ago by Watling Mfg. Mirror Fortune Telling Profit Sharing Scale © 1928 Watling Mfg. Co.